DID YOU KNOW that our users have found that CBD is effective in treating anxiety, sleep, localized pain relief, fibromyalgia, and arthritis? This size has 2400mg full spectrum CBD oil (40 mg CBD per ml). The lid is child resistant, and the dropper does come with mg measurements to ensure easy measuring. This CBD oil comes in either a "natural" flavor or a "spearmint" flavor. Please let us know in the comments which you prefer! 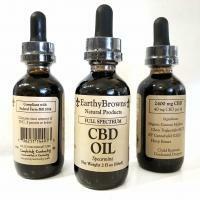 This CBD Oil is compliant with Farm Bill 2014 and was approved by KY Dept. of Agriculture. The Hemp (CBD) extract used in this product was grown under the KY Hemp Pilot Program. The hemp was harvested, extracted and packaged in KY. This product was packaged in a commercial kitchen with a state permit. Hemp (CBD) extracted with organic alcohol. All base oils in product are certified organic. Each 2 fl oz jar contains 2400mg of full spectrum Hemp (CBD) extract. Hemp was tested in the field, after extraction and in the final product to guarantee CBD and THC content. Our product is KY Proud and KY Crafted. ***These statements / products have not been evaluated or tested by the FDA and are not intended to diagnose, treat or cure any disease.